It's now a year since I first got a starter kit of Idratek parts and 7 months since we had the heating system overhauled with Idratek temperature sensor & relay modules at the heart, but till now I've been mainly using Reflex programming for operation rather than leaving a PC on to run Cortex. The reason for this is baulking at running a PC 24/7 and the power that will consume. But a few days ago I decided it was time "to let go of the sides" and give it a go. Switching the timer controlling our upper floors from "timed" to "on" (24/7), it was now completely down too Cortex whether to burn gas all night or make us shiver in the evening. The first signs are very good. 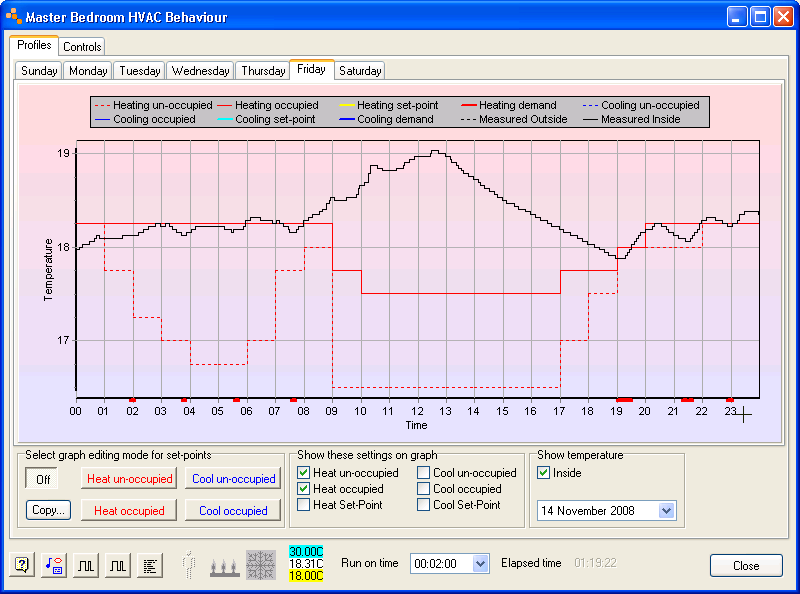 After carefully setting the temperture profile, the master bedroom seemed warm enough -- better than previous nights -- and according to the red marks at the bottom of the HVAC graph, across 24hrs the heating had only "demanded" 7 times, each time no more than 45 minutes. 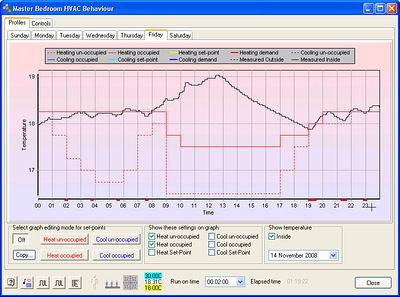 The graph below shows the actual measured temperature (black) vs the defined set-points, with the red spots/bars along the bottom showing the points of demand. The next step is to move the "spare" temperature sensor from this room and install it in the twins' nursery, ready for when they start sleeping in their own room. This module also has a PIR to set "occupied" (warm) and "unoccupied" (cooler) settings.